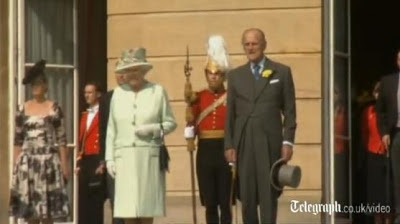 The Queen invested the Duke of Edinburgh with the Order of New Zealand in the presence of the High Commissioner for New Zealand at Buckingham Palace. Later, she hosted a garden party, accompanied by other members of the royal family. Click above for an article and video from the Telegraph. 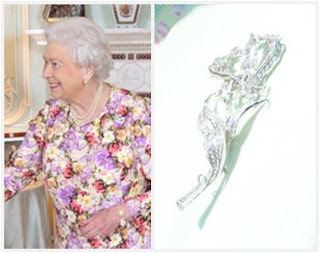 On a happier note, the Queen wore the Flame Lily Brooch again (for the garden party, following the petite Greville Scroll - which practically disappeared into her floral dress - for the Order of New Zealand presentation). I always forget how much I adore that delicate piece of artwork until she sports it, and then I fall in love all over again.